After escaping from a Huntsville prison, convict Butch Haynes and his partner Terry Pugh kidnap a young boy, Philip Perry, and flee across Texas. As they travel together, Butch and Philip discover common bonds and suffer the abuses of the outside "Perfect World." In pursuit is Texas Ranger "Red" Garnett and criminologist Sally Gerber. A Perfect World touches you from the bottom of your heart. It is a story about a man and a boy. A man escapes from a prison with his partner who he does not like. After escaping, they kidnap a little boy. It is not a simple kidnapping story as people expect with violence and blood. This man, as he describes himself, is not a good guy, but not the worst either. The boy, living with his mom and two sisters, follows their family��s religion, which forbids him from celebrating Halloween, celebrating Christmas, participating in parties, and pretty much any fun common for children of his age. The man gives the boy opportunities to play the games that he wants to, tells him what is wrong and what is right, and asks him to be independent and make his own choices. Great Story but Falls Flat, 10 August 2005 Author: Wulfstan10 from United States A Perfect World is a great and interesting story with massive potential. 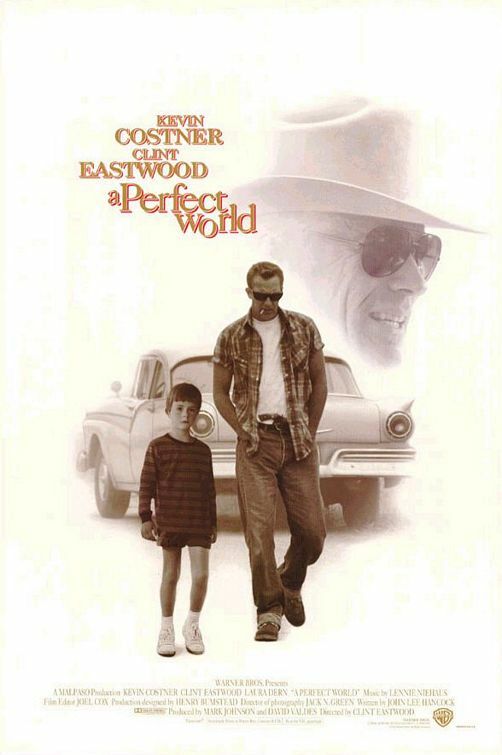 The plot and characters are meaningful and have great potential, while Costner's character in particular is complex. On the one hand, he is a violent criminal, yet at the same time he can be sympathetic even if one cannot truly like him. The development of his relationship with the boy, while the police are after him, is excellent and creates a much more thoughtful film than one that simply involves police after a bad kidnapper. On the one hand, the viewer cares about the boy and wants him rescued, yet at the same time he is not in the hands of a one-dimensional stock villain.Of the actors, Costner himself does a very good job (as he sometimes does!). He is believable and sympathetic and unlikable at the same time.The problem with the movie is that it's almost (not quite, but almost) ruined by Eastwood's typically careless and uninspired directing and general handling. One major problem, common with Eastwood-directed films, is that it's not quite convincing, a problem which appears to be a result not of the story or acting, but the directing, overall handling of the characters, details, etc. Here, this is particularly true with respect to the time period. The directing also fails to make the most of the potential emotional impact. As usual, Eastwood's directing shows technical proficiency but nothing more: no artistry, insufficient attention to details, etc. Had this been handled by a different director, it could have been a truly great film. As it is, it is worth watching but kind of falls flat.